Three Masters - Three Cabbies! Master of The WCHCD, David Cannell (centre) flanked by Master of the Parish Clerks, Stephen Plumb (L) and Master of Watermen & Lightermen, Simon McCarthy. The Election Court Lunch held at Watermen's Hall brought together a unique moment in the History of the City of London and Livery Companies. The current year sees a true first in the City of London, as three London taxi drivers preside as Masters of three seperate Livery Companies. Master of the Worshipful Company of Hackney Carriage Drivers, Dave Cannell is one of a long line of working cabbies who have been Master of the cab trade's Livery Company, but this year is very different as Mr Stephen Plumb, also a working London taxi driver is currently serving his year as Master of the Parish Clerk's Company, as well as filling the position as Lower Warden of The Worshipful Company Company of Hackney Carriage Drivers. Completing the taxi trade trinity is Mr Simon McCarthy, Master of the Worshipful Company of Watermen and Lightermen, also a working taxi driver. 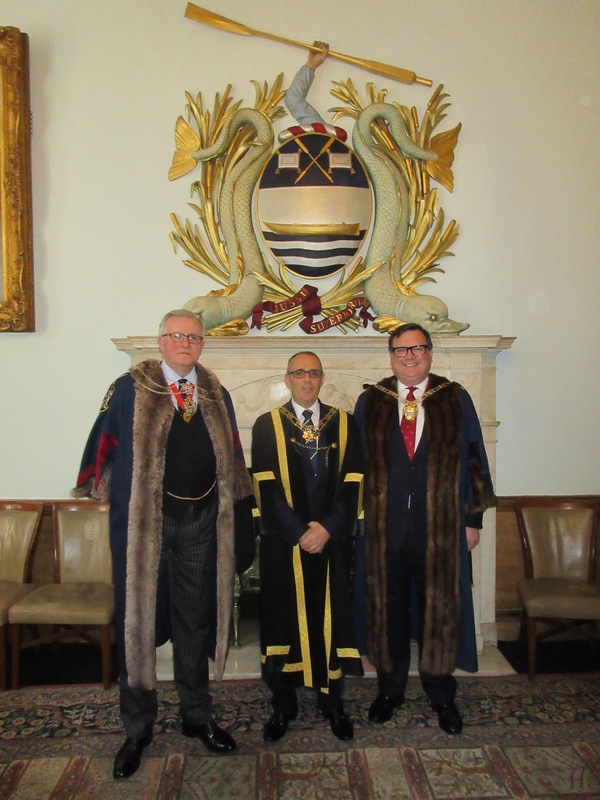 The Watermen and Lightermen played host to The Worshipful Company of Hackney Carriage Drivers at their Election Court Lunch in May and this occasion brought the three taxi driver Masters together for the first time. Welcoming The Worshipful Company of Hackney Carriage Drivers, Mr Simon McCarthy noted how the Watermen's Company drew many parralels with the taxi trade as they served the conduits of travel around the historic capital. Master of The Worshipful Company of Hackney Carriage Drivers Mr Dave Cannell commented: "It is a fortuitous coincidence that this moment in time brings together three individuals from our great taxi industry as Masters of three very different but historically significant Livery Companies in this geat City of ours." "This has never happened before and may never happen again and it says something about the unique position our taxi trade plays in the square mile." On 12th September following the Installation court, newly installed Master Phil Davis admitted five new Freement to the Company. The Worshipful Company of Hackney Carriage Drivers continues to grow its membership from across the taxi industry. 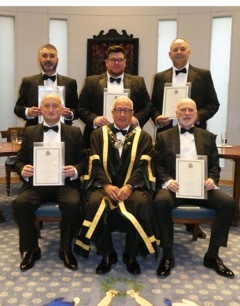 Master Phil Davis, the Wardens and the Court of Assistants all warmley wlcomed the five new Freemen: Mr Michael Calisto, Mr Stephen Crisp, Mr Jason Kron, Mr Matthew Phillips and Mr Peter Powell. All now have the opportunity to apply for the Freedom of the City of London at Guildhall and thus progress to become Liverymen. This is exactly the process Mr Stephen Bates recently went through and at the Installation Court he was clothed in the Livery and thus becomes the Company's most recent Liveryman. Also during the Installation Court, two new Court Assistants were admitted: Mr Kevin Nutley and Mr Chris Hearnden. It was also announced that Mary Whitworth, Clerk for the Company, would step down in November and the Master welcomed new Clerk Designate Major Belinda Tregear. It was also announced that Past Master Mr Eddie Crossley would step down from the Court after many years service and the Master and Court thanks Eddie for his sterling service. 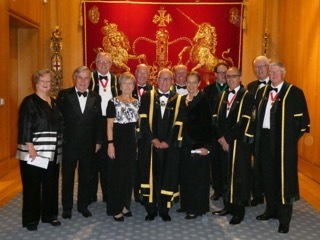 Wednesday 12th September 2018 saw the Installation Court and Dinner at the wonderful Haberdashers' Hall in Smithfield. Past Master Mr Phil Davis was installed as Master for the second time in his career as a special gesture to commemorate the 25th Anniversary of the Children's Magical Taxi Tour, which Phil has led for the past quarter of a century, taking countless sick and terminally ill children to Disneyland Paris. Master for the past 12 months, Mr David Cannell, handed over the reigns to Phil in an emotional installation ceremony, which sees David become Deputy Master for the year ahead. Phil thanked his Wardens for agreeing to remain 'as they were' in their current roles for one further year, to allow him to step in as Master for a year that is sure to be momentous. In his first official duties as Master, Phil then swore in five new Freemen, a new Liveryman and two new Court Assistants - Mr Kevin Nutley and Mr Chris Hearnden. Phil also admitted outgoing Clerk to the Worshipful Company of Hackney Carriage Drivers, Mrs Mary Whitworth, as an Honorary Freeman, to mark her incredible service to the Company over many years. Major Belinda Tregear was also welcomed as the Clerk Designate, in readiness to take on the important role from November. Phil also paid tribute to Mary Whitworth in his speech at the ensuing dinner at a packed Haberdashers' Hall, and Mary received a standing ovation from all present to congratulate her on such an outstanding career with the Company over the years. The dinner marks the start of a very busy calendar for Master Phil Davis and the 28th September sees the send off of the 25th Children's Magical taxi Tour to Disneyland Paris, with a spectacular banquet at Mansion House to follow in October.